After the failure, our company was in a financial crisis. Reality was forcing us to subdue, but we fought back. Reality made us realise we had a team of talent, and so we altered our business model and Xiao Xiao Media was born. – Dawn Lim, co-founder of Xiao Xiao Media and Sad Piggies. Dawn Lim and Ian Tay were 2 colleagues who got to talking one day after “a bleak day at work”. “It seems like we’re just being lead to the slaughter,” he shared in an interview. Work was stifling and and it felt as if they were simply headed towards their “execution”. As designers and board game lovers, Dawn and Ian jumped into building their own. 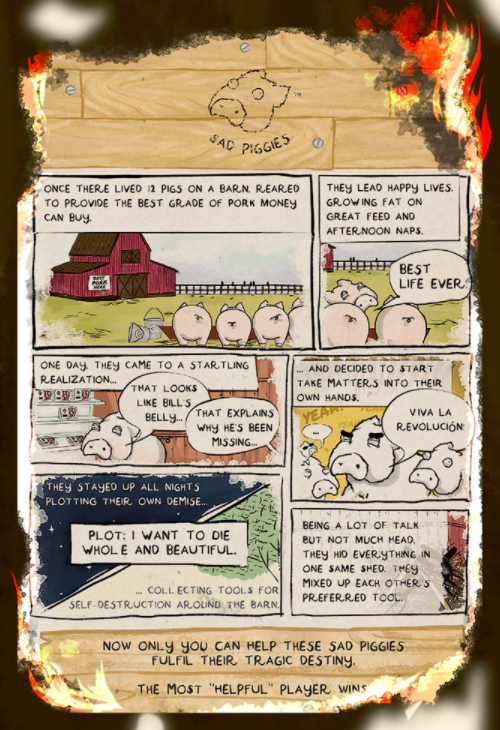 Sad Piggies is a game where player can help pigs die honourably. It’s almost like Monopoly Deal, except instead of collecting properties, you collect piggy corpses. And instead of sly dealing streets, you steal your competitor’s suicidal stat wannabes. “[Kickstarter] ideas are plenty but the dollars are limited,” Ian said in a previous interview, and if you didn’t fully understand your competitors and market “you won’t get funded”. The Sad Piggies Kickstarter was cancelled midway having only raised 38% of its asking goal. In a Vulcan Post interview, Ian revealed their experience as designers, the ability that allowed them to create Sad Piggies in the first place, also hampered their own success. 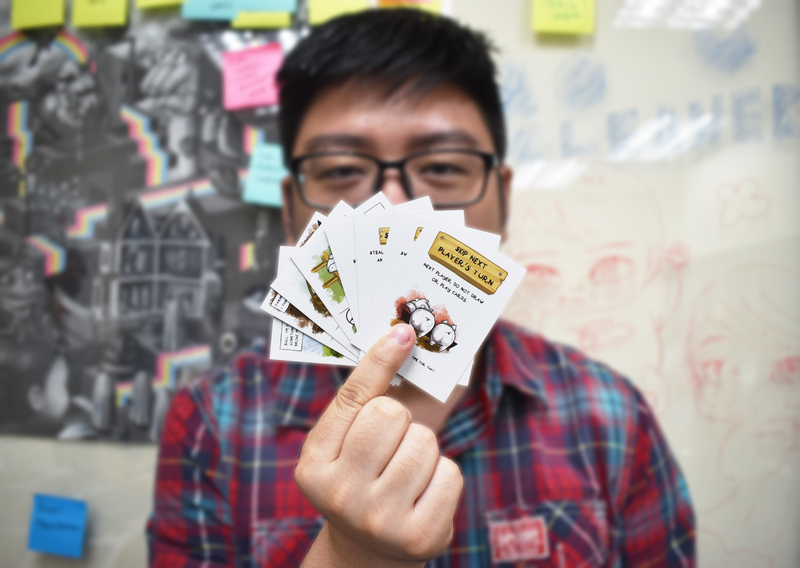 The pair crowdsourced feedback on game mechanics – which fared great – but neglected to do the same for card designs because as designers, they thought “they knew best”. We assumed people would get our artistic expression of only using black and white to portray the game’s morbid nature. We were clouded by our own excitement. Another aspect that threw them off their game was a lack of focus on Singapore. All in all, they had “lost the bet” – a lesson that cost them $20k in savings. Dawn and Ian are back again, and they’re even more dogged in their endeavours, but this time they’ve also learned from their failures. The pair are now co-founders of Xiao Xiao Media, a startup offering branding, product, UX and UI services to media enterprises, startups and government entities. Their service sector has grown quickly to include worldwide clients, Dawn reveals, and the revenue has been helping them break even from Sad Piggies 2.0. The startup has also been “a growing up stage” for Dawn, Ian reveals. 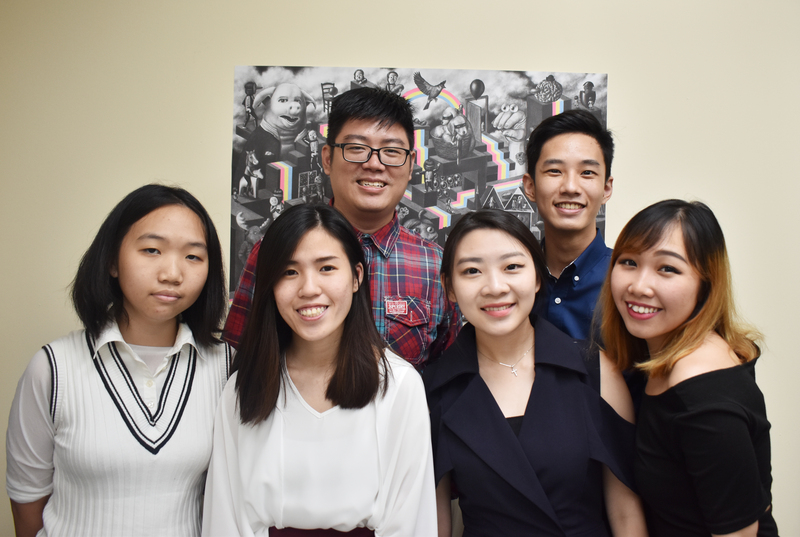 His co-founder has become more courageous and confident in pitching Xiao Xiao Media, and people no longer underestimate her for her young age (22). As for the game’s second iteration, they’ve revamped the entire design with colours and validated it with their target group. 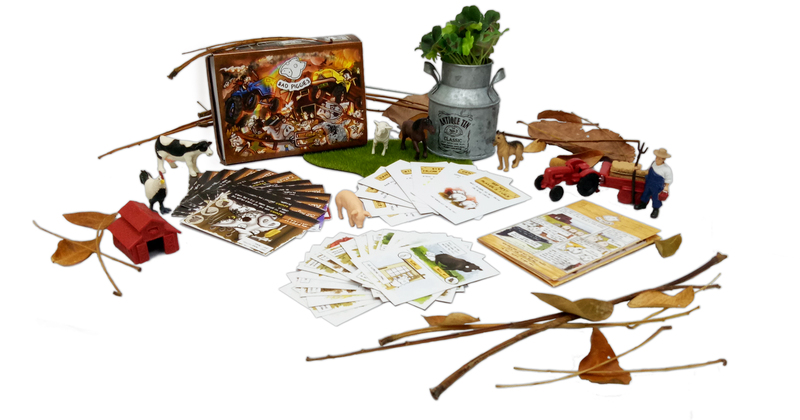 The card game also now comes with a story, with the team “highlighting the character’s backstory through illustrations”. “Hopefully, our fans will be astonished by the newest design,” Ian smiles. But, test plays at conventions and game cafes have burgeoned their confidence, and the pair knows they are onto something great. Not only that, but their team size has already tripled and they are actively hiring to support a growing clientele base. “Hint hint”, Dan laughs, teasingly. 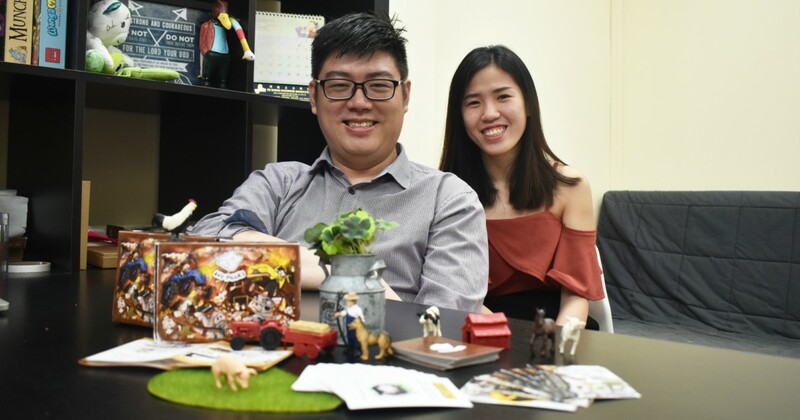 Although they are “fearfully optimistic” about their second Kickstarter shot, they hope the investment and changes made will encourage people to support a local game designer. Another reason for their relaunch is because “they are not quitters”. As serious entrepreneurs, we have a vision we want to achieve. This product is one way of accomplishing it, and failing one time isn’t enough to make us call it quits. We will continue to iterate until we have exhausted all resources. If you’re interested in checking out Sad Piggies version 2, here’s the link to their Kickstarter page and Instagram.